What is the charges tab & what charges are listed? You can upload up to one hour of video for free. Once you’ve exceeded this, you will need to purchase additional hours. If you are selling from a custom website, e-commerce platform, or via Vimeo OTT API integration, there will be a $1 charge per fulfillment each month. For in-app subscriptions in your branded apps, there will be a similar charge per subscriber, per month. This is for In-app subscriptions that occur through iOS, Android, etc. Since we don't control the payment, we have to charge for the access after the fact. As such, the fees are not deducted at the time of sale/purchase. If you’ve decided to take your project to the next level by opting to create your very own branded app, you will find that this activity also appears under the Charges tab. 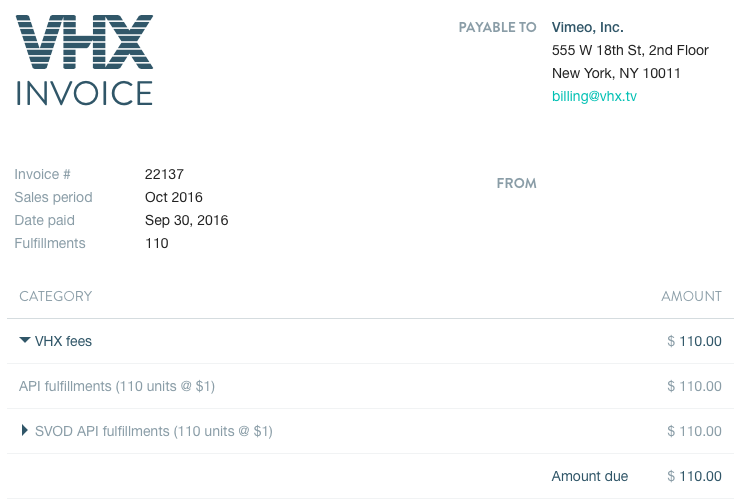 To ensure the billable activity listed above does not become outstanding and that your account remains active, make sure to add a credit card to your Vimeo OTT Seller’s account. Please note that the billing info in the charges section is different from your payout information. You can add your credit card directly from the Charges page.